Living on a ranch, it seems almost taboo to not raise our own chickens. As soon as we moved in, our friends and family started asking about when they could start getting farm fresh eggs. The problem was, I had never raised chickens before. My family had an eclectic variety of poultry birds, including geese, ducks and even a Golden Pheasant, but never chickens. One of my early experiences was a goose incident where my mother was the chosen target of a goose attack when she was feeding the birds breakfast. Feathers were flying, wings were flapping, honking and hollering was coming from the coop! My mom finally grabbed the thing by the neck and shook it to get free all the while scolding it for being a bad bird! It still remains one of the most hilarious legendary stories in our family. Goose attacks aside, I was a bit apprehensive about getting chicks, as I had heard so many myths about raising chickens that I wanted to ensure I was prepared to be a chicken mama. It turns out, these little mother cluckers are so simple and fun to take care of, that we now have a flock of ten! Below are the truths and tips for raising backyard chickens we have learned! Chickens are super easy to care for. Unlike some farm animals, chickens are pretty low maintenance. 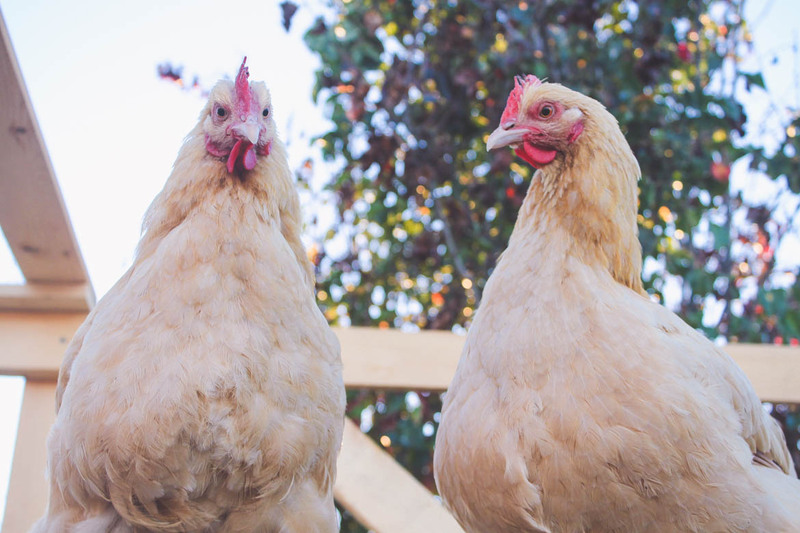 In the morning you need to feed them some regular chicken feed, which you can buy inexpensively in bulk, throw some chicken scratch on the ground for them to peck at, replenish their water and check for eggs. I also make sure their hen house doors are open so they can go on adventures. In the evening, check for eggs again and ensure that they are safe by closing doors to keep out predators. It’s that simple! They love adventures. I didn’t realize how true this was until after ours matured into adults. They get easily bored hanging out in their coops all day with nothing to do. Our chicken coop is inside our fenced off garden area, so I often let them out to play. They dig for bugs, peck at the ground and cluck around all day. In the evenings they come back in to roost, so typically there is no need to round them up. My mother cluckers are fantastic at helping me garden. They are great little bug catchers and eaters, so they keep bug problems to a minimum. They naturally ‘fertilize’ my plants for me. By ‘fertilize’ I mean poop, just in case you didn’t catch that. I just have to ensure when it is close to harvest season, I keep them away from certain plants, or they will eat all the goods! Apparently they love strawberries! Egg production changes due to seasons. It is normal to automatically think something is wrong when your egg production slows down, but if it drops off in the winter, it is no cause for alarm. Most folks think it drops off due to the colder weather, when in reality it is related to the amount of light in the day. Roosters are not needed for egg production. You only need a rooster if you would like the eggs to be fertilized, i.e. : if you want baby chicks. I happily have ten female chickens. Why does that make me happy? Because my neighbors have a rooster whose internal clock is off! The dang thing sings his alarm clock ‘cockadoodledoo’ at 2 am. He would probably be chicken dinner by now if he were my rooster! The term ‘pecking order’, is real. The struggle is real. I have now introduced five new blonde chicken babes to my crew. I can’t tell if the brunettes and redheads are just jealous because they wish they were blonde, or simply if its a nature thing? (I HAD to sneak that in! I AM BLONDE!) I didn’t realize how mean other chickens could be when introducing new cluckers into the flock! Just beware. Eventually it calms down but holy moly, pecking orders are real! Chickens know their owners. In fact, studies show they can recognize up to 100 human faces. It might sound all crazy chicken lady, but when you feed them and give them ‘chicken massages’ you are able to create a bond with them. When I go out to feed them in the morning alone, they often react in a positive, happy way, knowing I will pet them. When I visit them with my youngest in tow, they are a bit hesitant, as she is still learning that it can be a bit scary for chickens to be chased by humans, even if the little human just wants a hug! Eggs can last for up to a month without refrigeration if they haven’t been washed. Due to bloom, which is a natural protective layer, eggs can be left unrefrigerated for up to a month. I don’t recommend them being left out for this amount of time, especially in the heat, but it is a good tip to know! We try to eat them or share them with friends as quickly as possible, but I feel the best time to eat them is within a week or two.